All Soul proudly presents “The Creation of Pinocchio” directed by the Italian Master Maurizio Mistretta. “The Creation” is the first episode of the Pinocchio series and an experimental approach on Pinocchio investigating the birth of this independent marionette. The dynamics and the actions of our play start off from the most controversial points within the works of Carlo Collodi which contribute so much to elevate it as original and inimitable work. The wonderful cast is comprises Patchanee Poonthong as Pinocchio, Ellie Marleen as the Fairy, the Talking Cricket and the Chicken, Robin Schroeter as Master Ciliega, the Fox and the Old Man, Chris Wegoda as Master Gepetto and the Cat and finally Maurizio Mistretta as the Fire Eater or the Master of Puppets. Pinocchio is a marionette without threads, an antique robot able to talk, cry and think. How can it be possible? He was discovered as a piece of wood by one male carpenter, Master Cherry and subsequently created by another male carpenter, Master Gepetto. Is this normal? Master Cherry and Master Geppetto are typical for a couple of countryside friends in Tuscany. They are loyal, quarrelsome and easy to slap each other. They live precariously and, maybe for this, they are absolutely ingenious to no be surprised about anything and to accept the very absurdity of their destiny. Pinocchio is a NEW FIASCO for their poor existence. Master Cherry as a nouvel Ponzio Pilato washes his own hands clean. It is his way! And then Geppetto puts in this all his energy. The marionette Pinocchio is a permanently defective product. He doesn’t respond correctly to commands, or using different words to convince him to stay on the right path, no he follows his own way. In fact what can we expect from a marionette without threads? Pinocchio “modus operandi” is to discover, without mediation of what is going on around him. Often Pinocchio is considered to be an anarchist and naughty. This is an opinion. But it is not necessarily the correct one. Maybe Pinocchio simply is a champion of optimism, despite his humble origin. Our marionette discovers unexplored worlds. He describes the past and present world with his total ingenue delicacy. He dreams at the future with superhuman power. Pinocchio is really stupid, but his stupidity is natural and different from the common one. His stupidity is a genuine desire for Universal Justice starting from his own issues, but not limited to that. Pinocchio is not alone, he carries the whole world inside of him. Performances Saturday 9th, 16th, 23rd, and 30th of July. Maurizio Mistretta has been in Thailand since 2001 and carried out a multitude of activities at different correctional institutions. 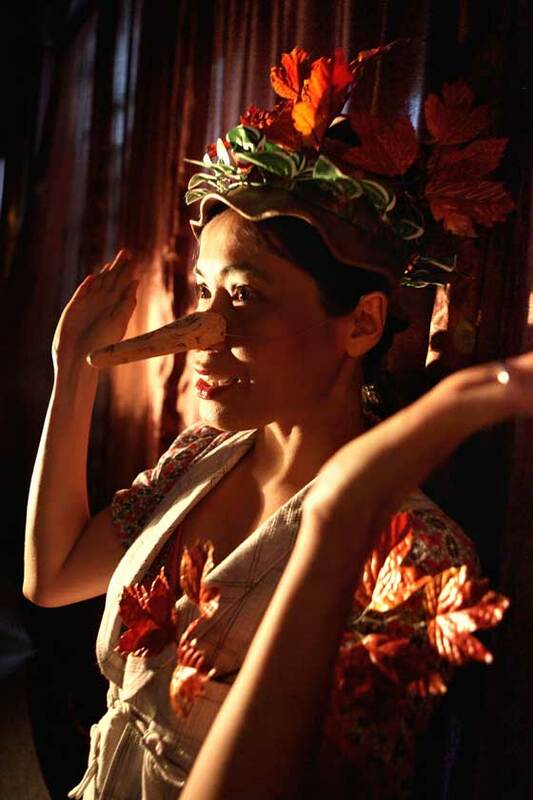 One of them being the production of “Pinocchio in Siam” in collaboration with the Juvenile and Family Court, Unicef and the Asian Southeast Delegation of the European Community. In 2004-2005 Mistretta developed his first trilogy on Pinocchio at the public elementary school Sooruamnamjay in Klong Toey, Bangkok, for a project promoted by the Bangkok Metropolitan Administration.